This was an interview I conducted for Filmoria with Steven Knight, the writer and director of Locke starring Tom Hardy. It was published in 2014 when Locke was being released on DVD and Blu-ray, but as Filmoria now longer exists, I am republishing it here. 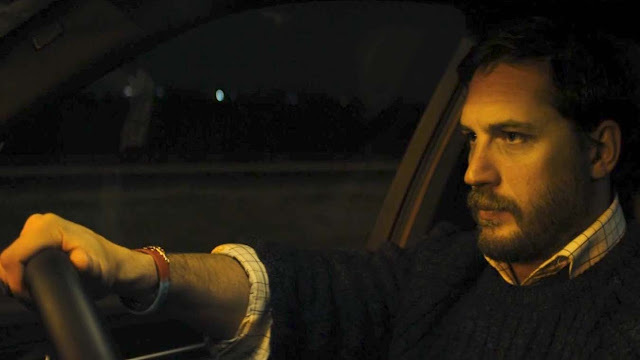 Locke follows a pretty ordinary character as he travels down a motorway one night. How hard was it to fund this film? Well funnily enough, it wasn’t a problem. I’d just made a film with IM Global and I had the idea for this odd little way of making a film. I had a meeting with Tom Hardy about a different project and then told him that I was shooting an almost theatrical experience on screen. He was all for it. So I wrote it with him in mind. So then we approached IM Global with two things; very low budget and Tom Hardy. They liked the script and they just said ‘yes’. But I think the main thing is that it was very low budget and so it’s a very small gamble. I had the meeting with Tom in late October and we were shooting in early February so it all happened very quickly. 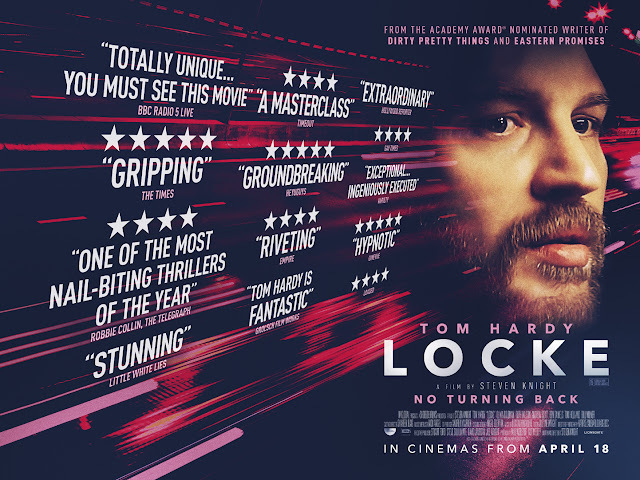 It seems to me that everything about Locke is a producers worst nightmare... a main character who is a pretty ordinary guy... a construction manager who cheats on his wife. No one in the film is in any danger, it has one setting, one character... did you think to yourself that you had to have a star to get this film made? Yeah but not just a star, you need a really good actor. I always think that whoever is on the screen, people are looking at Tom anyway. It was great to get him to play the part. A lot of these decisions were not deliberately perverse but not what you’d normally do. The whole thing I set up as everyone can have a holiday from what they normally do and it will be fun. So we shot the whole thing from beginning to end. Every time I said ‘action’, we shot the whole thing, then took a break then shot the whole thing again which I then edited together. In terms of selling it, I think I wrote a paragraph about what is was about to IM Global and they said ‘fine’. But my thought was, I’m pretty sure that people are intelligent enough to come to a cinema and sit and look at the experience of an ordinary person and find the drama within it. Rather than have the imagination put on the screen for them with special effects and everything. One of the best comments I got from this was people saying that they forgot that they hadn’t seen the other characters because they’d invented those characters for themselves. And I think that’s a more old fashioned way of telling the story with people picturing things in their head. The whole thing was ‘would it be enough to do this?’ and we had no idea if it would be or not until we took it to Venice and the response was so amazing. It was almost like in every way doing the opposite of how you would normally make a film. One of the most striking things to me was that you chose to have your main character Locke having a cold... was that in the script? I’d love to say that it was a metaphor for something really important but Tom had a cold when he turned up on the first day of shooting. The normal response is make up on the nose, medication to dry him up and all that. Rather than do that, we thought it would be possible to have your marriage break up and have a cold at the same time and why not? So the medicine you see him taking is the medicine he is really taking. I heard that Tom was reading off cue cards for the entire shoot. What was the thinking behind that? Well because I wanted to shoot everything in one go and not do takes. I wanted to see if we could do it without constantly going back and doing it again because I think when you do that, you get something totally different from if you’re just doing it and knowing that you’re going to do it again tomorrow and it might be different. It would have been impossible for him to learn 90 minutes of dialogue. So we put autocue in two places on the low loader in front of him. We had it running in the rear view mirror so that he could look at the rear view mirror and see the script as well. Tom wanted it to be word for word. He didn’t want to improvise at all so what you see including the dot dot dot and the pauses is him following the script. I said at the beginning, ‘if you want to go off and improvise in the conversation that that’s fine’ but he said he didn’t want to. Retrospectively he was right because it would have been chaos if he’d have done that. Because the other actors had the script on paper in a conference room where they were holed up. Tom had the script in front of him so the conversations he had were pretty much word for word which was great. So you ran through the whole film each time without cutting and doing extra takes... how much directing did that allow you to do on location? What we did is we spent five days with all of the actors including Tom sat around a table and reading the script over and over again. Any issues of character and motivation and all of that was dealt with in that room so that when we went out on the road, the only direction I ever gave to any of them was ‘less, less, less, less’. Ivan is a character who controls things. He normally calms people down so he doesn’t ever get emotional. At least don’t get emotional on the phone, the sound of the voice. One of the great opportunities that you get with this sort of thing is that you can have someone talking very calmly on the phone while tears are running down their face. What you’re seeing is truth and what you’re hearing is not and it makes you know that you’re seeing into someone’s soul basically. So you had three cameras all running at the same time for each run through of the script but I felt like I saw hundreds of camera angles in the film. Am I wrong? No you’re absolutely right. What we did is we set up three cameras and we started rolling. Every 28 minutes, we had to pull over to change the memory cards in the cameras. So we’d pull over into a lay-by and it would be like a pit stop in Formula One. Everyone knew what they had to do, they’d change the memory cards but also take the opportunity to change the lens and the angle. So in fact we had three different set ups within each pass at the film and then obviously we did 16 versions of the film. So in every take we had lots of options. So where were you during filming... in the comfy hotel with the voice actors or out on the road with Tom? I would love to have been in the hotel conference room but I wasn’t. I was on the back of a very cold and wet low loader, on a piece of canvas facing the car. The car was strapped to the low loader. I had contact with the conference room and the actors and contact with Tom. I would say action and we’d set off and that was it. Were you watching monitors or just looking at Tom in the car? I had a monitor with the three different camera angles on it but also looking at Tom. Mostly when you’re in that situation, once you know the set up you don’t need to keep looking at the monitor so it’s more looking at the performance in the car. You’re working on Peaky Blinders and have a variety of upcoming film projects. How are you finding working in both TV and film? I do see them as different things. My day job is writing and doing commissions and all of that. And then if there’s an idea I feel I can direct then I do that. TV is not something I thought I’d do but Peaky Blinders is the story of my Dad’s uncles and it’s a story I’ve wanted to tell for 20 years. I don’t think it could be told as a film. Well it could but it would be shorter whereas with telly, the way it’s going at the moment, you get a lot more opportunity and a lot more time and you get great actors wanting to play the parts. It just felt that that family saga was better suited to TV. TV’s great, as a writer it’s fantastic because you are pretty much in charge of that whole thing. You have many upcoming projects... are you itching to get back in the directing chair? I’m probably going to direct something in the middle of next year which is again going to be quite an odd way of shooting something. It doesn’t sound particularly entertaining but it’s about the last days of someone’s life who has Alzheimer’s. That sounds terribly depressing. But in the same way that ‘man who works in concrete drives down a motorway’ (laughs). I’ve got a plan to make it very almost like science fiction. And you’re writing that as well? Will you only ever direct things that you write? Yeah absolutely. I can’t imagine even begin directing someone else’s thing. Will you work with Tom Hardy again? Yes I’m sure I will. We’re doing a project together already. I would imagine you will hear more about that quite soon. I’m not being mysterious on purpose. They like to announce these things in their own ways.